The Sonictrac® Pro Model STP200-000 is a distance measurement device that uses ultrasonic technology to detect and measure targets up to 30 feet away. An Environmental Grade electrostatic transducer combined with Carotron’s microprocessor technology interface and processing circuitry provide distance measurement devices with reliable and accurate operation in a wide range of applications. Measuring distance with ultrasonics makes use of the fact that sound travels through air at a known speed. 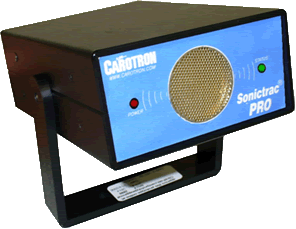 The Sonictrac® Pro sends out a stream of ultrasonic pulses and precisely measures the time until the pulse echoes return. This round trip time period is used with the speed of sound constant to calculate an accurate distance reading. Basic setup can be achieved by utilizing the teach input to “teach” the unit the minimum and maximum distances. Advanced functions are available by connecting the unit to a personal computer and using Carotron’s STP Link software. In linear mode, the unit outputs a voltage signal either proportional or inversely proportional to the distance. The hyperbolic mode is useful in center driven winder applications that require diameter correction in order to provide a constant material line speed.